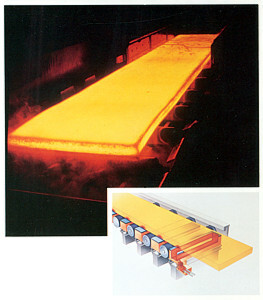 Slabs up to 43" by 8'6" in lengths to 32' are heated at the rate of 88 tons per hour. The line features oscillating for short mill delays along with the ability to process slabs side by side, staggered or with split conveyors. Skidmark heating with induction represents a low investment and is the ideal way to maintain maximum production flow and quality. Induction heating is the perfect companion for direct hot rolling. 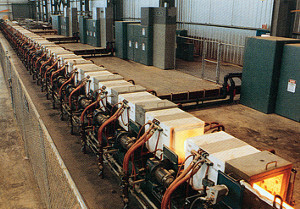 Here, this user reduced his energy costs by taking advantage of casting generated heat. Substantial improvements in quality and surface finish were made by adjusting corner temperatures just prior to rolling. 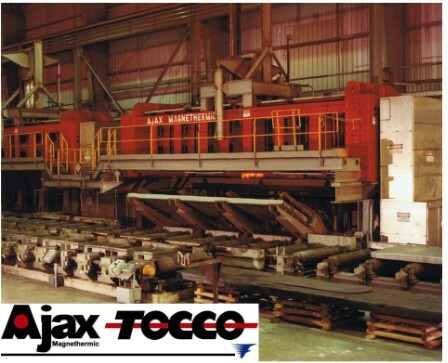 The key to successfully rolling superalloys is this 12 megawatt Ajax TOCCO Magnethermic designed computerized induction heating line. 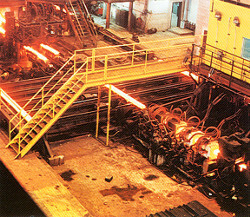 This 157 ft. line is the first to use bar codes, features 26 induction coils and complete computerization to provide the flexibility required to quickly change alloys. 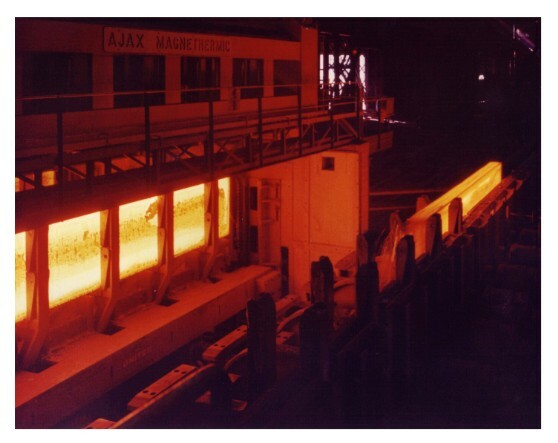 Vertical slab heaters eliminate many of the problems associated with horizontal heaters such as refractory issues, Material handling concerns, and temperature variation due to handling the slab horizontally. 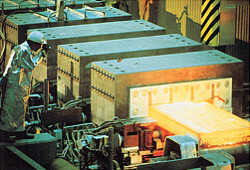 In addition because these heaters heat one slab at a time, offline, multiple units can be utilized to meet required production rates and for multiple alloys. These heaters can be used for reheating, heating from ambient, or as booster heaters to increase production from existing gas fired or electric resistance furnaces.